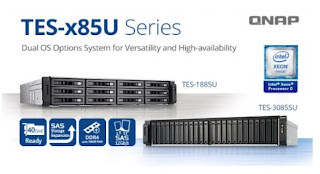 QNAP Systems, Inc. released the powerful enterprise-class TES-x85U NAS series, including the 18-bay TES-1885U and the 30-bay TES-3085U. Both models are powered by a high-performance yet energy-saving Intel® Xeon D processor, and provides the choice of dual OS inside a single rackmount NAS. Users can choose to install the business storage QES operating system or the app-centric QTS operating system based on their needs. The TES-x85U series with QES is the perfect backup storage for the dual-controller Enterprise ZFS NAS (ES1640dc). The 12Gb/s SAS-enabled TES-1885U and TES-3085U adopt an advanced 14nm Intel Xeon D 64-bit SoC processor with an integrated PCH (6-core and 8-core respectively). Both models have two built-in 10GbE SFP+ ports to natively support 10GbE network environments, and can further boost system performance with PCIe Gen.3 expansion for additional 10GbE/40GbE adapters and PCIe NVMe SSD. The high-density TES-3085U is especially useful for providing an ultra-fast all-flash storage solution that offers up to 24 drive bays and 6 dedicated SDDs bays for caching. QES features ZFS, the best file system for business data storage, and supports multiple advanced functions for high-end enterprise storage, including RAID-Z for data protection, nearly limitless snapshots, SnapSync, data deduplication and in-line compression for optimized VDI storage performance, self-healing, and more. With SnapSync, the TES-x85U can be used as an efficient backup system for QNAP Enterprise ZFS NAS to immediately recover all the backed up data locally to take over operations and services with maximized uptime. The TES-x85U with QTS performs as an all-in-one NAS solution. QNAP’s Qtier Technology empowers the TES-x85U with Auto Tiering that helps continuously optimize storage efficiency across SSDs and SAS/SATA drives, providing utmost efficient storage center. A comprehensive disaster recovery solution is fulfilled by rich backup options including volume and LUN snapshots, RTRR, rsync and cloud storage backup. Users can create Windows, Linux, UNIX and Android virtual machines for extensive applications on the NAS using Virtualization Station, or initiate LXC and Docker containers and IoT development with Container Station. QTS provides services for diverse application servers (including a web server, VPN server, and FTP server), and the App Center includes hundreds of install-on-demand apps to expand NAS functionality (including Surveillance Station for security surveillance, Q’center for centrally managing multiple QNAP NAS, and more). The TES-x85U series is certified for VMware vSphere 6.0 and supports VAAI, provides compatibility for Microsoft Hyper-V with the support for ODX and Windows Server 2012, and supports Citrix XenServer 6.0 to maximize flexible deployment and management in virtualization environments. The scalable TES-x85U series can connect up to 8 QNAP expansion enclosures (REXP-1620U-RP and REXP-1220U-RP) to flexibly expand its raw capacity. With VJBOD (Virtual JBOD), users can also mount the unused storage capacity from other QNAP NAS units to the TES-x85U and create virtual storage pools and volumes for operating NAS services as if they were using local drives.